Missoula, Montana – Two models of Sun Mountain supercharged golf bags with portable power packs are in golf shops now. The bags have an external USB port wired to a portable power pack capable of recharging a mobile phone and powering a mobile device. 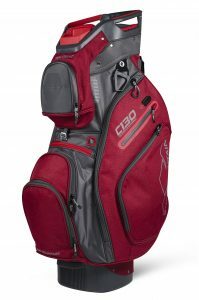 C-130 Supercharged cart bag has a retail price of $279.99 and the 4.5 LS Supercharged carry bag is $249.99. For the retailer nearest you, call 800-227-9224 or visit www.sunmountain.com. The Supercharged golf bags come equipped with a 7800 mAh rechargeable, portable power pack capable of recharging a mobile phone three times. This power pack has two USB ports, one standard and one rapid-charging, allowing recharging of multiple devices at the same time. C-130 Supercharged offers all the award-winning, golfer-friendly features that have made the C-130 the top-selling golf cart bag including a 14-way top with a putter well, an abundance of pocket space, Smart Straps that offer a better way to secure the bag to a golf cart, an easy-access range finder pocket, and now the elegantly integrated portable power pack. 4.5 LS Supercharged is a supercharged version of the Sun Mountain 4.5 LS carry bag. C-130 Supercharged is available in: black; navy/white/red; gray/lime, and chili/gunmetal, cobalt/black and desert camo. 4.5 LS Supercharged is available in: black, navy/white/red, camo/sand and red/steel. For 30 years Sun Mountain has been a pioneer in the golf industry, revolutionizing golf bags, golf outerwear and golf carts. 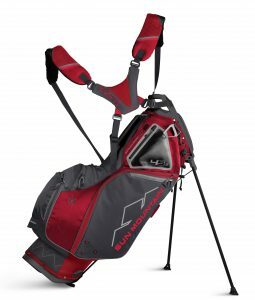 Sun Mountain’s many innovations, including the first lightweight golf bag and modern stand bag, have made it the top golf bag company in North America. Within golf outerwear, Sun Mountain redefined golf-specific performance first with the windshirt, then fleece, and again with its four-way stretch, waterproof, and breathable rainwear. The Sun Mountain Speed Cart® golf push cart transformed walking carts and created an entirely new category of golf products. Sun Mountain’s “Ahead of Time Design” motto drives the company to continually design and refine golf equipment. For the Sun Mountain retailer nearest you call 800-227-9224 or visit www.sunmountain.com.